That is what trainer Bob Harper told one of the contestants last night on The Biggest Loser. We were extremely delighted to see Bob pushing the contestants to get on the Arc Trainer. One of the main reasons The Biggest Loser switched to Cybex was to give the contestants the CYBEX Arc Advantage. Independent research has shown that the Arc Trainer burns calories up to 16 percent faster than ellipticals and other cross trainers tested—but with less exertion and lower risk of discomfort and injury. Just how big an advantage is working out on an Arc Trainer for a Biggest Loser contestant? Let’s put this into hard numbers. If an average person does three hours of moderate exercise a day on an elliptical, at an average of 625 calories burned per hour, he will burn 13,125 a week. In comparison, if that same person did the same level of exercise, for the same amount of time on the Arc Trainer he will burn 15,225 calories. A pound of fat is equal to roughly 3500 calories. The weekly difference in weight loss is almost a full pound—and that is for the average person doing just a moderate work out. Contestants on the Biggest Loser who work out strenuously on the Arc Trainer will see a considerably greater advantage every single week. Last night the difference between 9th and 12th place, in essence safe or not, was a mere two pounds. In other words, for a contestant on The Biggest Loser, the Cybex Arc Advantage can be make or break, winning or losing. 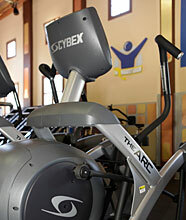 No wonder Bob Harper, an extremely experienced elite trainer, told that contestant to get on the Cybex Arc Trainer.